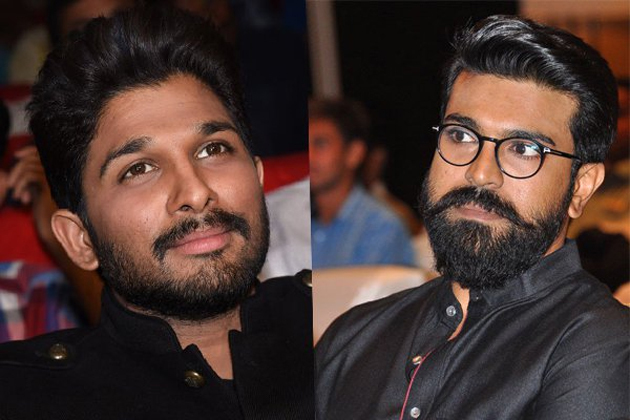 Hero Allu Arjun Became A Thorn For Hero Ram Charan? Mega Star Chiranjeevi is a phenomenon and he achieved lot more than any Telugu Hero ever imagined by taking remuneration more than Amitabh Bachchan, at the peak of his career. His fans always wanted another hero from his family to take care of his legacy and they supported Pawan Kalyan, Allu Arjun, Ram Charan Tej. Sai Dharam Tej and Varun Tej in that quest. As Pawan Kalyan became the Powerstar and rose to a level of top hero individually, the fight for real heir of Megastar as ensued between the popular heroes Allu Arjun and Ram Charan. Whenever a film of these two heroes releases, one or the other actor's fans start comparing with other's previous release and claim the throne. While, Ram Charan is recognised as the real heir by some, others try to promote Allu Arjun to the spot. To their credit, both the heroes have never let that negativity creep into their family relations and they decided to ignore all these comparisons. But with ever growing popularity of Allu Arjun, the fans of the actor are throwing a challenge to Ram Charan and his fans to compete. Duvvada Jagannadam, the latest film has once again become the topic of interest. Allu Arjun fans started comparing the opening four days collections of the movie to Charan's last release Dhruva. While, Dhruva is produced by Geetha Arts owned by Allu Aravind, father of Arjun, the movie released during demonetisation and the collections have been better than expected even in those dire days. But several fans in their bid to promote Allu Arjun as the true successor for Mega Legacy, they are comparing DJ collections with Dhruva and trolling the actor. Well, even though they do ignore such posts and comments, as Harish Shankar said last night, internet works for everyone the same and heroes might notice such posts one day or the other. Will this negativity effect their relationship? Has Allu Arjun became a thorn in the path of Ram Charan? At least, few Mega fans believe so!